Necklace Loma for One - made from stainless steel - 18K GOLD plated. 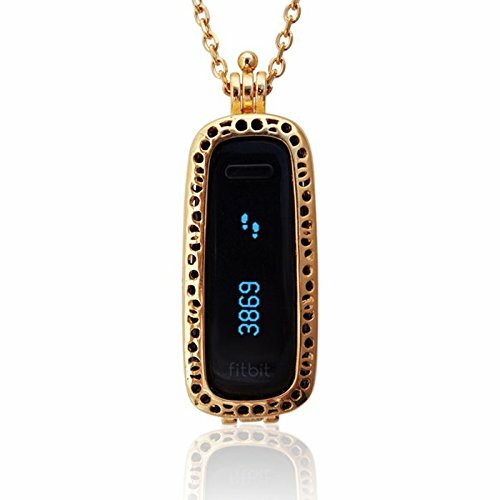 Turn your fitness tracker into a stylish accessory! We guarantee the best quality. Do not worry, the 18 GOLD plating is long-lasting. The pendant has a safe. And here is the very best: The pendant's design enables you to see the tracker's indicator lights all the time! So, if you want to check on your progress, you do not need to remove it. Details: - fitting stainless steel chain 30 inches (76cm) is included! - made from stainless steel - 18K GOLD plated - The One is perfectly held by the pendant - No rubber wristband or clip, so no ruining of your outfit! - Pendant: Height 2.3 width 0.9 depth 0.5 inch. It's a different way to wear your One! Add some style to your fitness tracker. You can turn on, for example, the FLOWER display on your OneTM and the Pendant is a great way to display the FLOWER on your chip. To charge the OneTM, remove it from the pendant. The OneTM tracker is sold separately. Please visit the site fitbit.com/one. For best results use the original OneTM clip to track workouts and sleep. NOTE: DEVICE NOT INCLUDED.